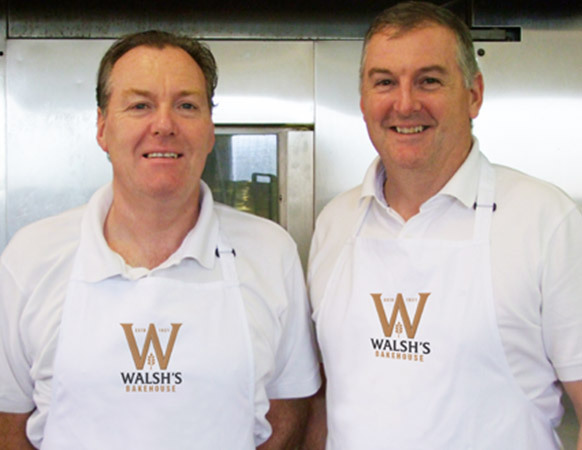 We are Michael and Dermot Walsh, third generation bakers of the Walsh family. We started our own bakery almost thirty years ago. Situated on Mount Sion Avenue, a place which reflects the history of the Waterford Blaa and and its’ connections to brother Ignatius Rice who founded Mount Sion School on Barrack Street in 1802 where he also had a bakery and tailor’s workshop. The real Walsh’s Bakehouse story begins with our grandfather, Patrick Walsh. He was born in 1882 in Kilmacow, Co. Kilkenny. Patrick’s own father died when he was young, but because he was the eldest in the family at that time, he went out to work as soon as he left national school. When he was old enough, he left home and joined the British Army, serving with the Northumberland Fusiliers. 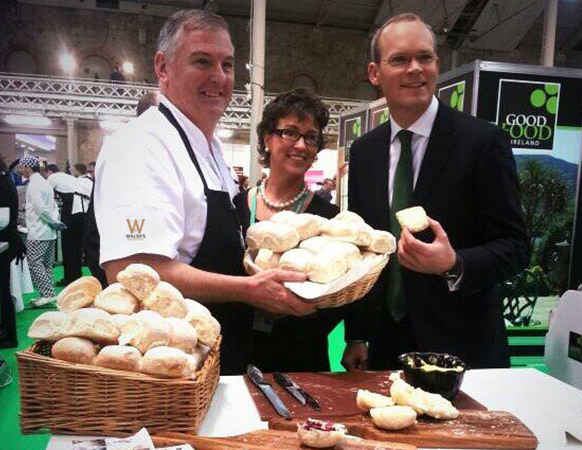 When he had served his time, he returned home to Kilmacow and trained as a Master Baker. During his career, Patrick became head baker of Bolands Mills in Dublin, and after his marriage to Kilmacow native Mary O’Callaghan, worked in Waterford as foreman in Smith’s Bakery of George Street and at O’Brien’s Model Bakeries. As an Army Reserve, Patrick was called up at the breakout of World War One in 1914. He rejoined his old regiment on the front lines in France, coming close to death several times. Patrick survived being a Prisoner of War for four years in Gressen, Germany, and was decorated with war and field medals at the end of the war. When he returned home, he had enough money behind him to start his own bakery on the Mayor’s Walk in Waterford before moving to Number 2 and 3 Ballybricken in 1928. Eventually, he went into the milling business in his home town of Kilmacow, where he had one of the largest water wheel mills in Ireland. Patrick made flour and oatmeal for the baking trade. Patrick Walsh was a Master Baker – and always a soldier at heart. We fondly remember him saying ‘Old soldiers never die, they only fade away.’ Our grandfather had a long and healthy life and passed away at 11am on the eleventh day of the eleventh month of 1967 – the time, hour and day when Armistice is traditionally celebrated. His legacy was carried on by sons Richard and Arthur, at their premises at Ballybricken. Here, they continued the great traditions laid down by their father at P. Walsh & Co.Bakers and Confectioners. Another son, Paddy, and two daughters, Stasia and Mary continued to develop and expand the Walsh family bakery, until Richard retired, followed some years later by Arthur. It was in this bakery that we first learned the art of baking traditional breads. In 1980 we attended Bakery School in Kevin Street College of Technology, Dublin, graduating in 1980 and 1984 with Diplomas in Bakery Production. Our professional learning experience and new skills were put to good use in 1985, when we set up our own bakery in Waterford. We inherited the family commitment to doing things right. 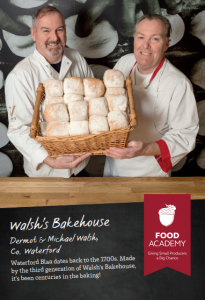 At Walsh’s Bakehouse, we strive for excellence in baking traditional breads and are proud to be one of the makers of the Waterford Blaa (PGI), one of Ireland’s protected foods.